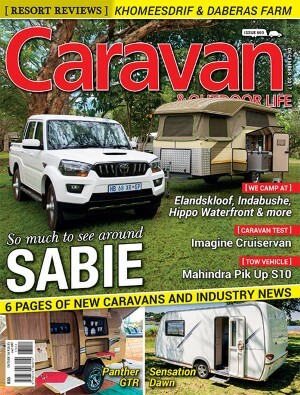 In the September 2017 edition of Caravan & Outdoor Life, we joined them as they travelled from Cape Town up the West Coast, and then into Namibia to the Fish River Canyon, Kolmanskop, Sossusvlei, Walvis Bay, Henties Bay, Damaraland, and Opuwo. When we last heard from them, they had already travelled 10 000 km, and had headed from Etosha south to Windhoek to service their vehicle. 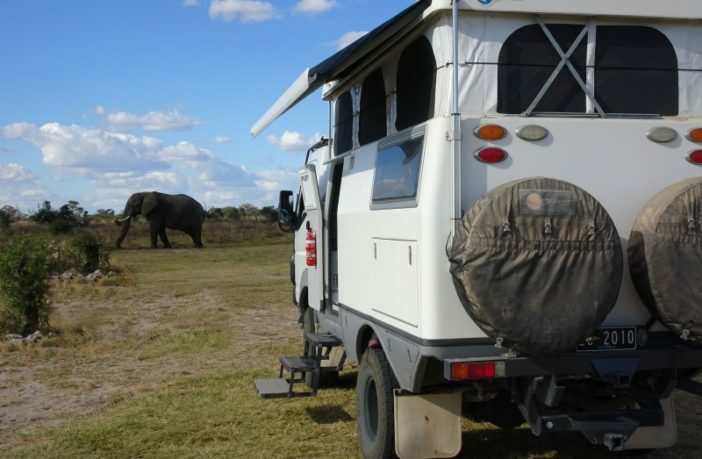 On the second leg of their journey, they head north east through the Caprivi Strip and into Botswana. After a week in Windhoek, staying at the Urban Camp and catching up with household duties and exceptionally good food (we contemplated kidnapping the chef), we continued our journey. First stop: Waterberg. We reacquainted ourselves with the African bush. The Waterberg plateau acts as a natural barrier, as well as providing a massive habitat for wildlife that is free from poachers and predators − like an island in the sky. I came to a realisation on this trip: When travelling in foreign countries, one is lured into seeking travel advice on the internet before doing the planning. I have learned to use internet sites with caution, as the negativity of the contributors is disproportionate and overwhelming. People either have totally unrealistic expectations, and shouldn’t be travelling the way they do, or shouldn’t go to the places they do. Or the reviews are by “internet trolls” who get pleasure out of writing negative comments, or possibly even get paid for them. We visited beautiful places to stay that were run by good people, but which had received unfounded bad reviews that damaged their business. Do yourself a favour: leave a little to chance, and have some adventures and surprises in your travels by not planning every move on the internet. What a great conservancy, taking advantage of the topography to protect the wildlife without fences. Once you reach Rundu and the Okavango River, the country changes, as water brings life to the region. There are more settlements and agriculture, there are fewer tourists, and the locals are friendly. We watched people going on with their daily lives − doing their washing, fetching water, watering their animals. 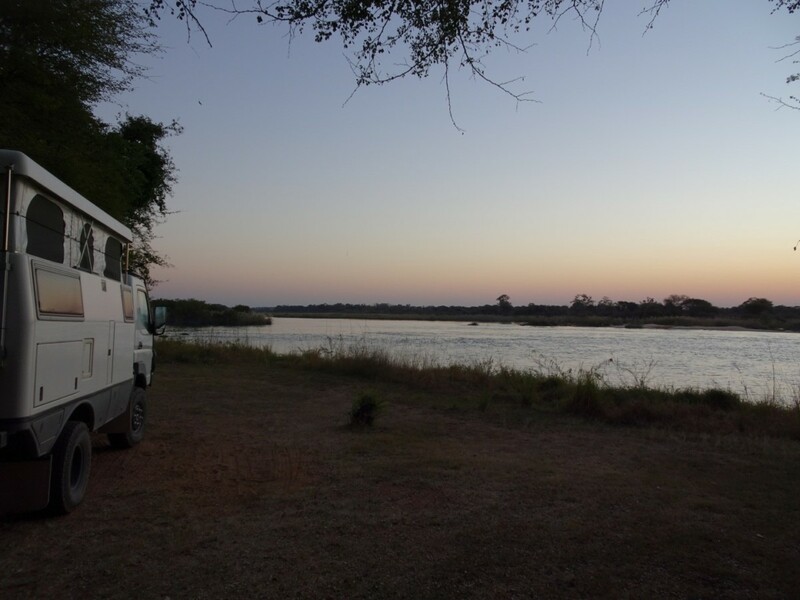 We stayed at a number of camps along the Okavango, all of which had great views of the river and across into Angola. The camps had lush green lawns, washing-up areas and private ablution facilities. Every morning and evening, someone came around to light the donkey to ensure that the facilities had plenty of hot water. 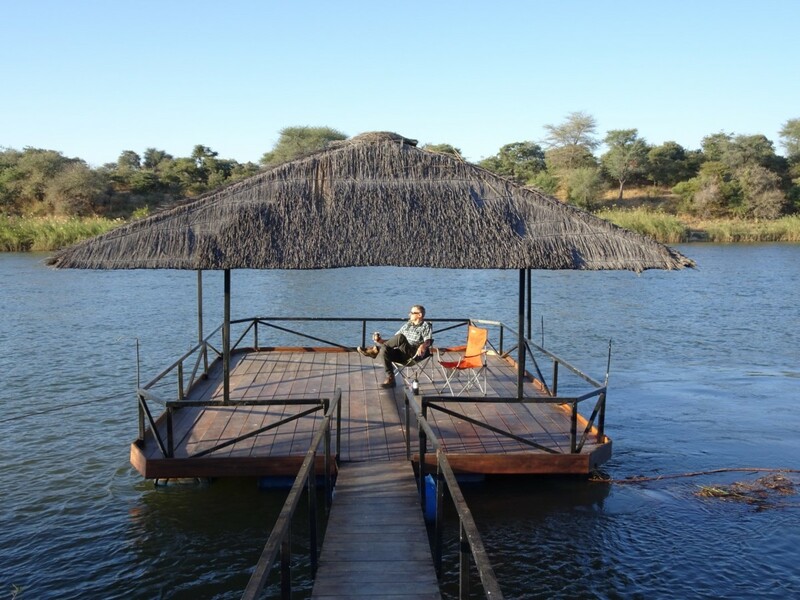 At one camp, we had our private pontoon to use for a sundowner trip on the river. Life is tough in Africa. 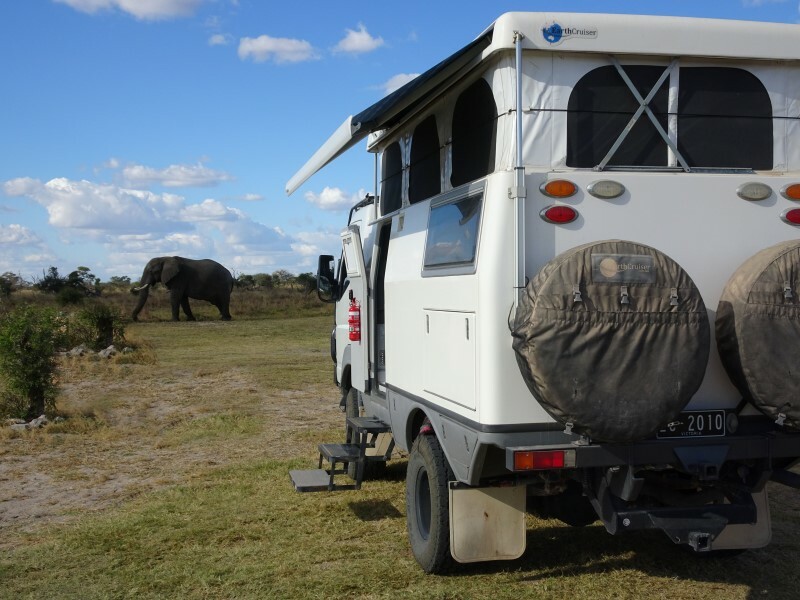 As we made our way along the Caprivi Strip, we dropped into a number of camps and lodges. Each has its own character and charm, and one would be hard pressed to pick a bad one. Along the way, we enjoyed slowing our pace and taking in the sights. One afternoon, we took a game drive on an island on the Kwando. We had to be transferred by boat to the island where the vehicle was waiting. Things started slowly. Sure, there was the odd set of ears and eyes of a hippo, or an elephant or two in the distance, but nothing exciting. We had drinks at a hide, but no animals revealed themselves. The guide stayed with us to the last minute, when sunset forced us to return. Well, nature and wildlife is unpredictable and, as always, it was nice to be surrounded by the great outdoors. On our drive back to the boat launch, I noticed some hippo tracks in the dust. Since the car was travelling in the same direction as the tracks, I kept an eye on them until the track turned sharp left into a clearing − and there she was. 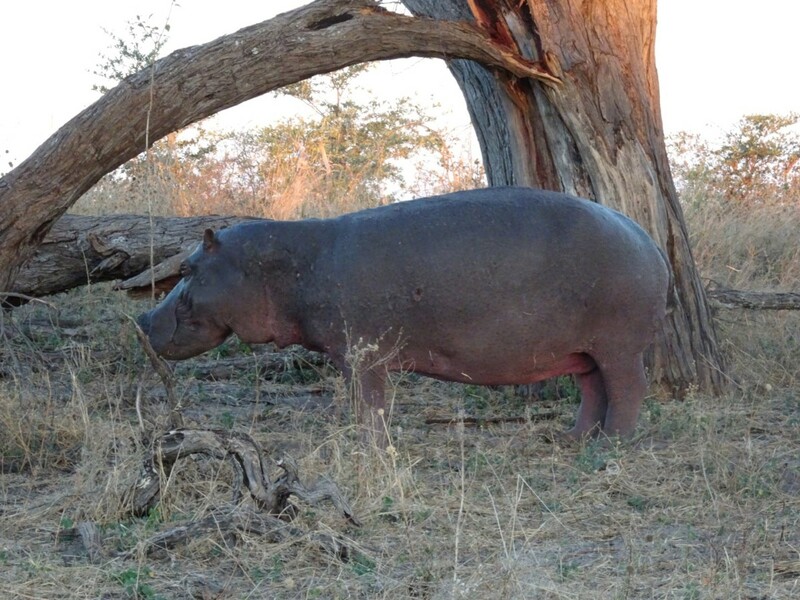 A full-sized female hippo cow, five metres from the game viewer. I had to bang on the roof to alert the driver and tell him to stop. We had a few seconds to take a clear picture before the hippo tried to hide behind some fallen branches. Our first hippo in full view! Now we really had to hurry to make it back. Our guide revved the boat through the bends of the Kwando River. Hippo heads and backs stuck out left, right and centre. Then I looked over my shoulder, and saw an angry hippo launch itself towards the boat, mouth wide open, front legs in the air, water rushing around it from the sudden movement. It is unbelievable that an animal the size of a car can move that quickly. What an experience. We didn’t know what to expect of Zimbabwe. 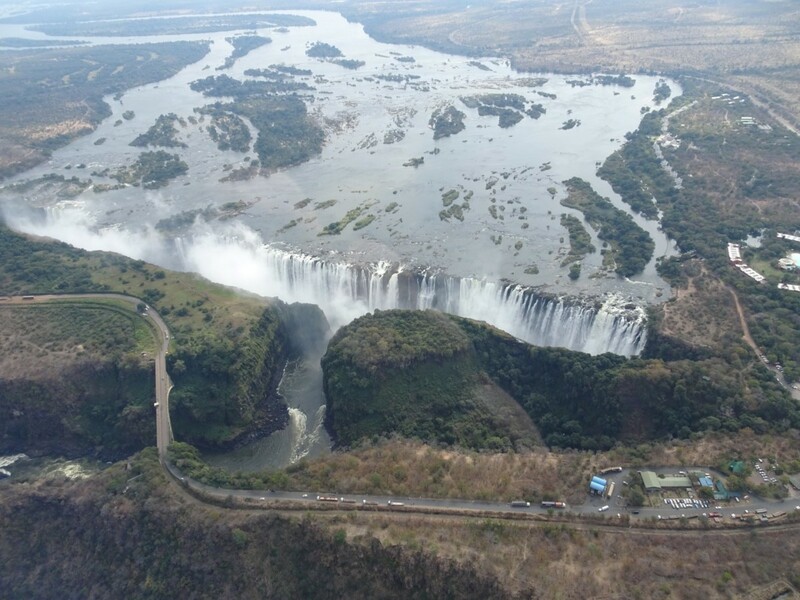 All we knew was that we wanted to see the Victoria Falls, and that Zimbabwe had seen better days, to say the least. We decided not to take our own vehicle over the border on our first viewing, but chose to be taken by a driver on a day trip. The border crossing was streamlined and helped by our guide. The walk around the Falls met and exceeded our expectations, and the helicopter flight over the Falls capped it off. We made a quick visit to the Victoria Falls Hotel, somehow a contrasting relic of the past, but we had no time for High Tea. Knowing what we know now, we could (and should) have spent more time in Zimbabwe. The people were lovely, with a wicked sense of humour reflecting their spirit under adverse conditions. Compared to Namibia, Botswana’s tourism industry is less organised and not as developed. To make advance reservations, or to research and plan just a few days ahead, makes it a hit-or-miss affair. Organised tours for international visitors dominate. We learned soon to ignore booking websites, and no longer tried to phone ahead. The information we received was usually incorrect, and when we arrived, we found that there were places available. But how do you find a nice place, with the right facilities, close to the attractions? Which tour company should you choose for a tour or an overnight safari? We found that it was a combination of trusting the “bush telegraph”, and sharing and exchanging experiences. There was also the good fortune of one place turning us away to drive us into the arms of a better destination. Take the time we arrived in Kasane. We had our mind set on a lodge recommended to us. Fortunately, we had to be turned away, and the gentleman at reception made a call to see if there was a place for us at an alternative that he recommended. In the end, we struck gold. More central, and where we wanted to be − close to the Chobe National Park. It had a booking office for arranging activities and great trips. We took an afternoon boat cruise on the Chobe River. We chose a small six-seater boat, as recommended by fellow travellers we’d met before. It meant that the boat was quicker and more easily able to get closer to where the action was. 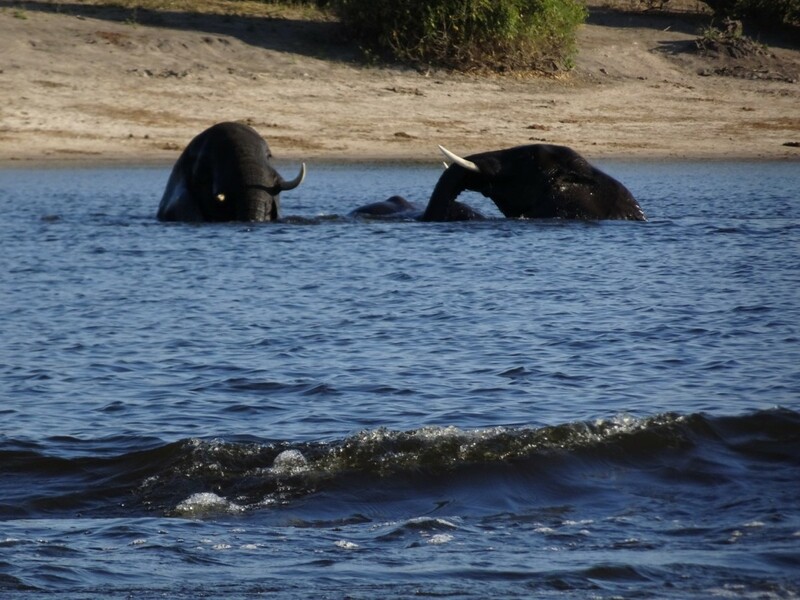 The highlight was a herd of elephants swimming across the river in front of us, whilst playing and enjoying their bath. The next major destination was the Okavango Delta. For weeks we’d been reading reports of road closures, flooding, and challenging conditions of the roads and tracks. At Kasane, travellers were exchanging their experiences on the direct route via Savuti to Maun. One couple had become bogged and were pulled out from a side track only two days later. Getting better maps and advice was a challenge, so we decided to take the easy road via Nata. We heard of an unfenced camp and lodge north of Nata, called Elephant Sands, and stories of a man-made waterhole that attracted elephants which walked through the camp and between the ablution blocks in front of the lodge bar and veranda. We were not disappointed, and saw streams of elephants. Maun is the hub and gateway to the delta. The number of tour operators, lodges and services is overwhelming. Guide books with detailed maps and camps were not where we were looking, and advice on Moremi camp availability was unobtainable. And it was peak season, with holiday travellers having arranged their bookings months in advance. And what were the best places to see? What tracks and bridges could our 4.5ton, not-so-average truck travel on? Fortune was on our side again. We picked a campground associated with a small local hotel which had a tour booking office next door, on site. First we checked campsite availability. Tick. Then we talked to the tour operator about what we wanted to get out of our experience. Another tick. Then we checked with the campground that we could park our vehicle securely whilst we were on Safari. Final tick. Choosing a tour operator is another hit-and-miss affair. But there we were in luck. We ended up on a two-night, three-day safari into Moremi Game Reserve with a driver, guide and chef from Afro Trek. Sammy and his team were fantastic. It was the full African tent-safari experience. We would never have been able to see and learn about the delta wildlife without them. We were hoping to see African wild dogs and lion, but as we know, nature and wildlife is unpredictable. Even on the drive to camp, Sammy was able to track down two male lions basking in the grass just metres from the vehicle. With rare birdlife, elephant, giraffe and zebra all in abundance, day one was already a success. We reached the secluded, unfenced campsite and our trusty team provided us with shelter, delicious food and great conversation. Staying in an unfenced camp in Africa’s wilderness is different to being anywhere else in the world. The last few wild predators and large wild animals are found only in Africa. Apart from your tent and a nearby vehicle, all that stands between you and being part of the food chain is bush skill experience. Go from the camp fire to your tent, or to the improvised drop toilet, and you’d better keep your eyes open. Feel the urge to go to the toilet at four in the morning? You’d better take your torch and see if there are any eyes reflecting the light as they watch you! You never know what might be creeping up on you. Was that alarm call of a bird, or ground squirrel? Ah, yes − the puff adder has just crawled by. Lions called all evening. And, as any experienced bush camper knows, the lions are getting closer when their fainter calls at the end of a roar become audible. As the night progressed, they walked less than 200 metres away in an arc around the camp. At 4:30am, a herd of elephants, including young calves, walked past only 20 metres from our tents. The following night, just after getting into our tents, we heard our guides making a lot of noise. It sounded as if they were packing up rather noisily in preparation for our departure the next morning. It turned out the camp was being raided by Hyena and the guides had had to fend them off… twice! The next day, what had started out as a low-key game drive with hardly even the common variety of wildlife soon changed tone, and in the end we tracked down an African wild dog den with pups. 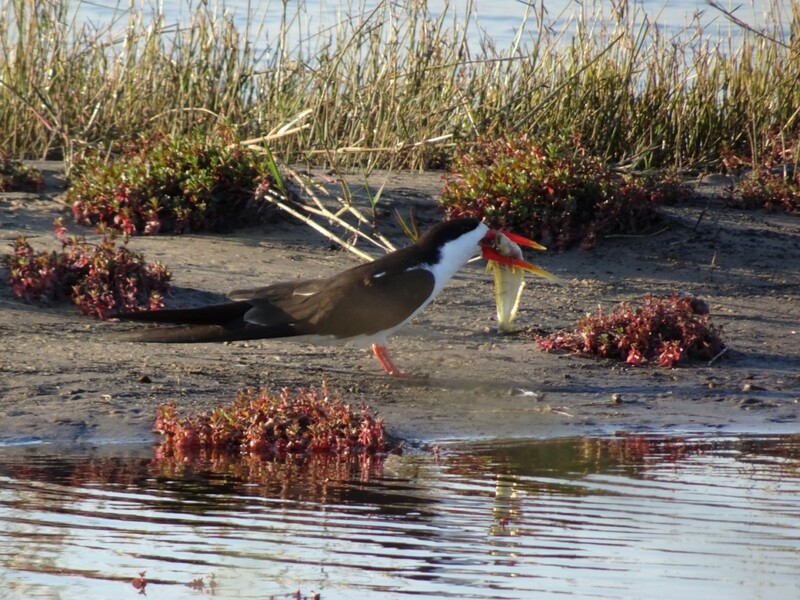 The adults were still feeding the young. In the afternoon, we found ourselves in the middle of an African buffalo herd, a hundred-strong, at sunset at a water hole. A quintessential African experience. Herds haven’t been that strong in the delta for years, and the guide marvelled at the sight of it. On our last day, and way out of the park, it looked like a “giraffe day”. There was a giraffe on every corner and behind every bush… but not much else. Suddenly, just moments before we had to make the decision to exit the park, another guide told us about a pride of seventeen lions nearby, mothers with younger ones and some cubs. Again, the experience of our guide paid off. He knew the location described to him, and a shortcut track to there, and he soon brought us into a prime position. Mission accomplished… unlike the poor souls we’d met the day before. An inexperienced guide got lost and could not find his camp site. His guests had to spend the night in the open vehicle without shelter or food. We met them on the morning drive, asking us for directions to third bridge. They were with a tour operator who’d had a good reputation until it was ruined by an inexperienced guide. 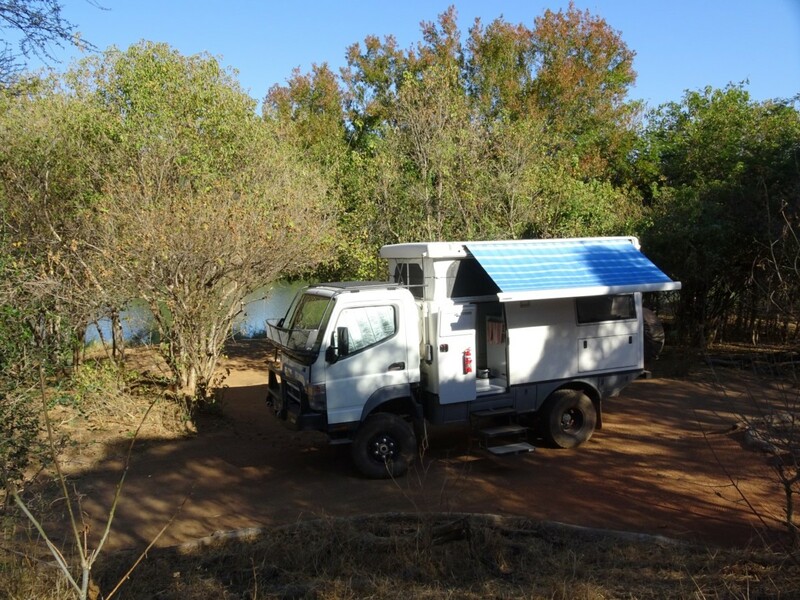 The EarthCruiser at Limpopo River Lodge, Tuli. Hippo, Susuwe Triangle, Caprivi Strip. 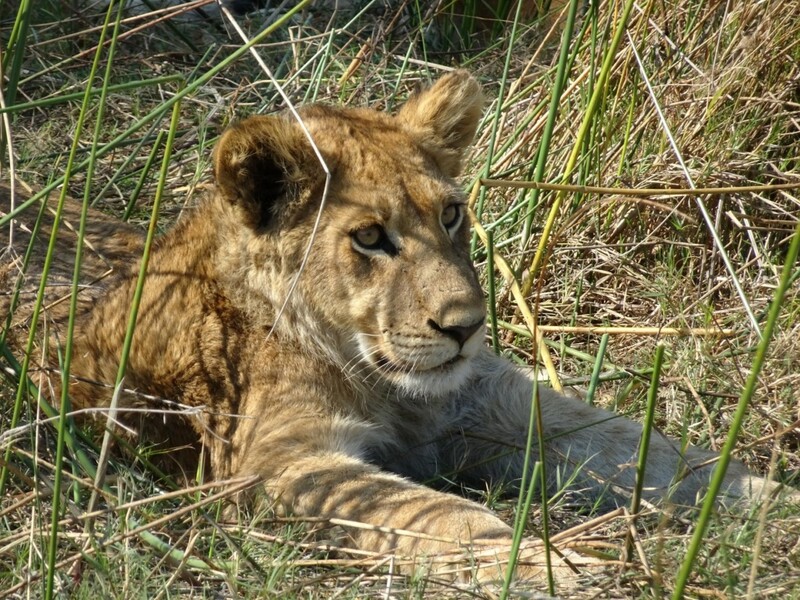 Lion cub, Moremi Game Reserve. 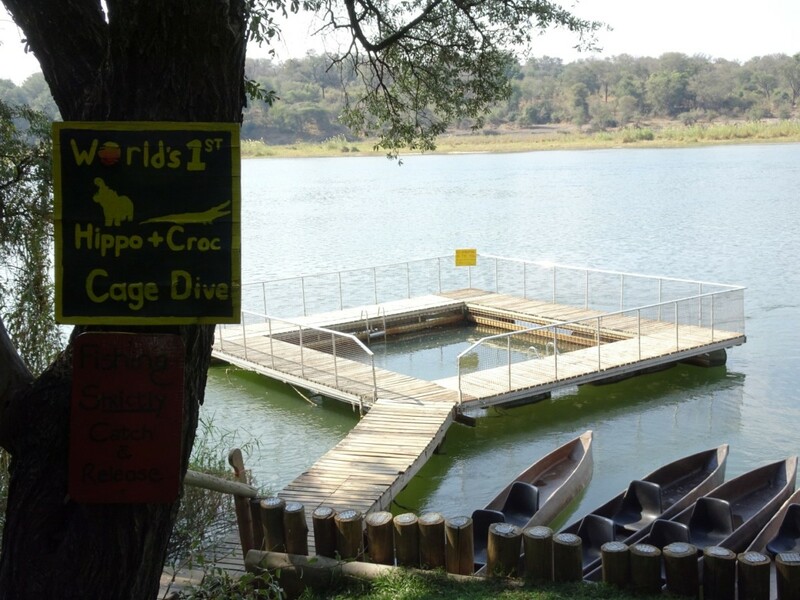 Hippo and crocodile diving cage at Ngepi Camp, Divundu. 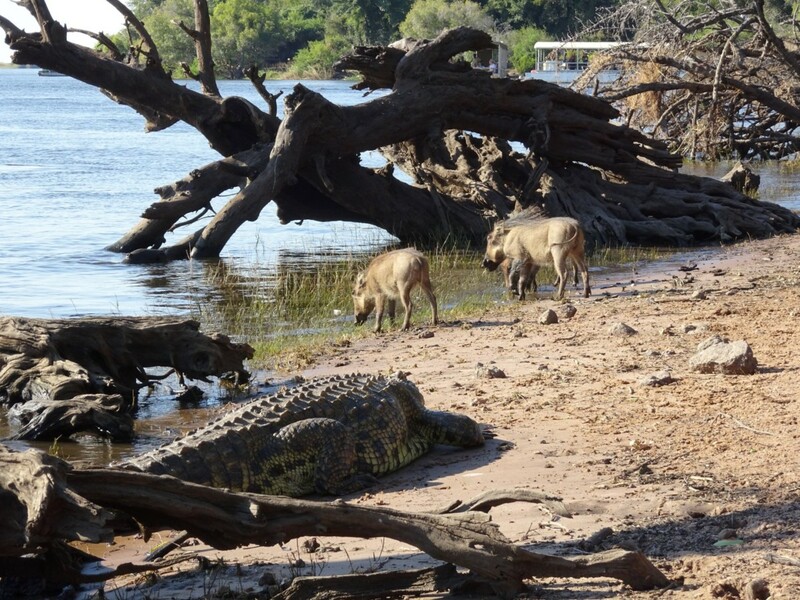 Nile crocodile & warthogs, Kasane, Chobe. 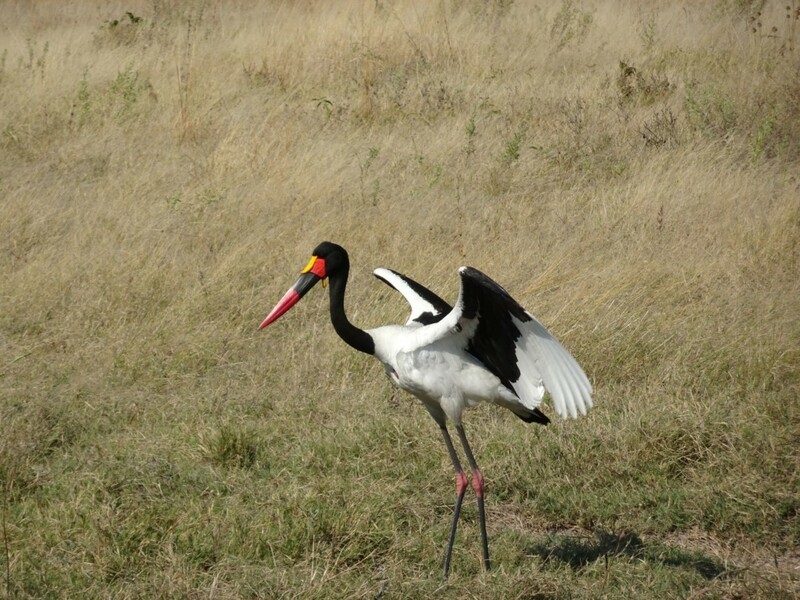 Saddle-billed stork, Moremi Game Reserve. 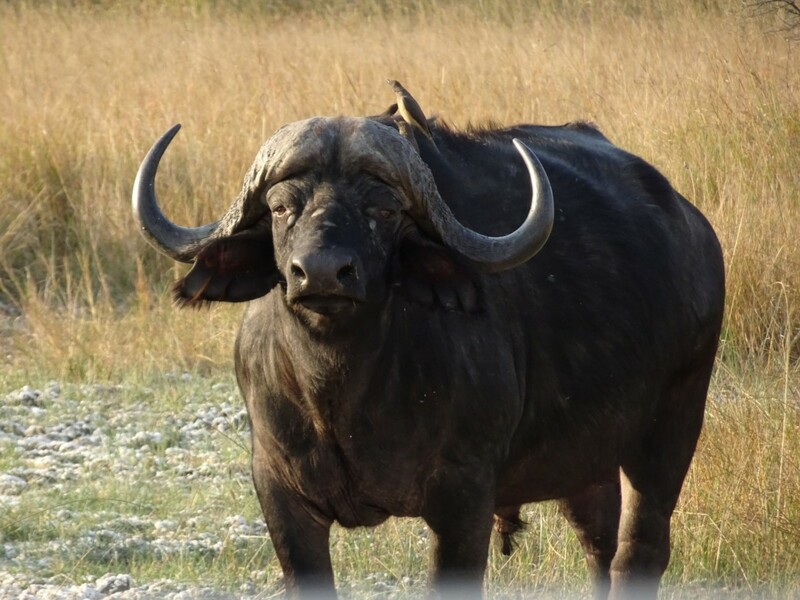 Cape buffalo, Moremi game Reserve. 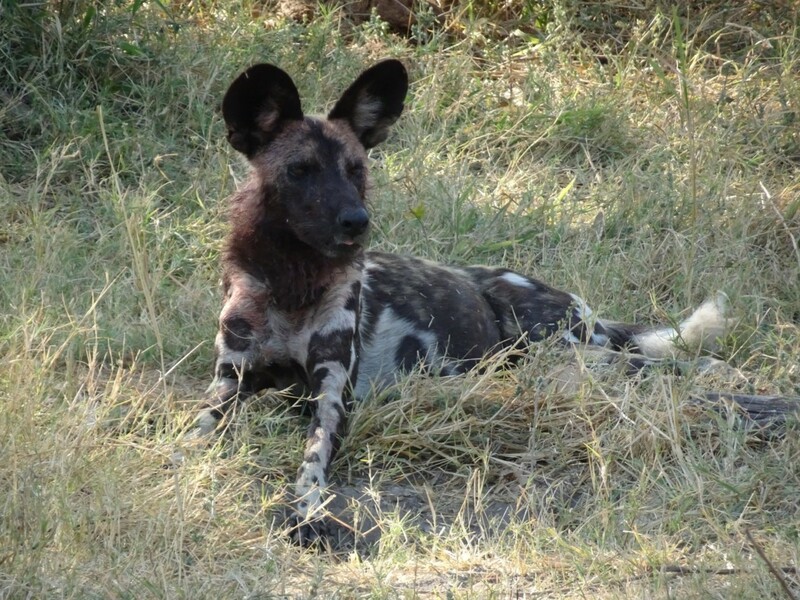 African wild dog, Moremi Game Reserve. We slowly made our way towards the Limpopo region, passing Botswana’s massive diamond mining operations on our way, where new townships and power stations were springing up. This felt as if it could be in Australia, or Alberta, Canada. First we headed south east to Goo-Moremi Gorge Lodge. This small pocket of country is like nowhere else in Botswana. The gorge is of special significance to the locals. You can take a guided walk up the gorge: one which takes you along a small creek through rainforest-like canopy, and over three stages past three waterfalls. The park is home to two endangered species of birds and also to two types of vultures. The campsites were very spacious and came with private ablutions. Our last stop before crossing into South Africa was at the Limpopo River Lodge near the Platjan Border Control. The roads in the region are pretty corrugated, and the border crossings are generally passable during the dry season. The camps at Limpopo River Lodge are right on the Limpopo River. We watched hippos close up in the afternoon from our campsite. That was the closest encounter with a group of hippos we’d had on this trip, except the one from a moving boat. This time we could just sit there and watch them without being rushed. Uwe and Meg are almost back in South Africa, but their journey is not over yet. The last stage of their African Adventure takes them to the Blyde River Canyon, the Kruger National Park, Swaziland, the Addo Elephant Park, and back to Cape Town.